Tyson Hosmer of Balmond Studio will be presenting this coming Friday (June 1st) at a symposium hosted by the New York City College of Technology. We will also be showing some of our latest research as part of the accompanying exhibition. 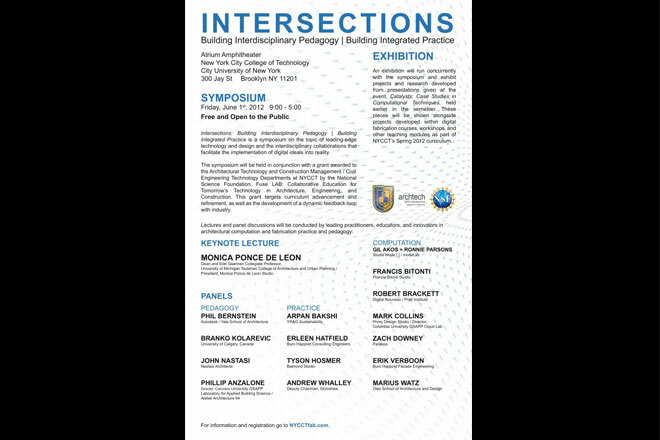 Intersections: Building Interdisciplinary Pedagogy / Building Integrated Practice explores the topic of leading edge technology and design, and the interdisciplinary collaborations that facilitate the implementation of digital ideals into reality.